A shower caddy is an essential accessory for keeping your bathroomneat, clean and gorgeous. It helps your bathing by keeping the important things close by when you need them. As easy as it seems, finding the "best shower caddy" can be a bit difficult. Different brands have different advantages in terms of design and space available. This comprehensive article will help the readers to identify the top shower caddy brands available in the market. 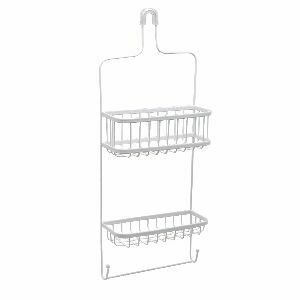 The OXO Good Grips Stainless Steel 3-Tier Shower Caddy 2.0 comes with an excellent built quality with its sturdy and stainless steel construction. It can accommodate different kinds of products like shampoo, soap, conditioners, etc. You will also get hooks that pair the caddy with the shower head and keep it safe while you bathe. The OXO can be installed without using external tools. The excellent design and shape of 21½ inches x 22½ inches x 4¾ inches dimension makes it a gorgeous product for your bathroom. You can effortlessly clean the tray by removing it from the frame. There are different bottle holes to accommodate longer items like shampoo. The caddy has a stable construction with PVC-free cups. You can watch the video review. It will help you to choose the product . Video credit The Container Store. The shower caddy is adorable for its compact design and stylish finish. InterDesign Raphael Shower Caddy takes small amount of space but you can accommodate numerous items that you may need while taking a shower. The product is made of sturdy steel with Thermobond Rust Resistant coating. The smart design is finished with 9.5 x 4.5 x 21.25 inches dimension. So, it is wide enough for you to put in a lot of stuff. The caddy has a deep basket and a shallow basket to give space for small and large items. You can place bottles like shampoo, conditioner upside down for its unique design. There are 2 hooks for putting razor and 2 regular hooks for placing other items. This InterDesign Raphael provides non-slip grip so that your caddy is not displaced. 21.25" x 6.5" x 4.5"
The Zenna Home 7617WW, Over-the-Showerhead Caddy is another option if you don’t prefer InterDesign. This is constructed with durable materials and grips to hold heavy and large items. You will get two shelves with the caddy. The bigger one holds in Shampoos, Conditioners and the small one takes in soap, toothpaste and others. That’s not all, the caddy features a towel stand with two hooks to take in your towels and other clothes while you wash yourselves. Also, Zenna Home 7617WW features dust-proof coating to ensure it stays dirt less for days. This is one of the best shower caddys fits most of the bathrooms for its compact design. It looks gorgeous with the shower head for its stylish design and finish. The InterDesign York Lyra Shower Caddy is renowned for its excellent design. The contemporary style and finish will make your bathroom more gorgeous. There are two baskets with the InterDesign York Lyra. You can place larger items on the bigger basket. You can place smaller items, like skin brush, soap in the smaller one below. The caddy comes with two non-slip grips. The grips hold the candy firmly by working with the cups. The smart small construction of 10" x 4" x 22" dimension made this item easily placed in any bathroom. You will notice that the shower caddy is coated with Thermobond. The Durable Rust-Resistant Finish made it dust resistance, so you do not have to clean it repeatedly. The Shower Caddy - Quick Dry Hanging Toiletry and Bath Organizer is made with excellent mesh fabric. You can easily clean it and dry this hanging shower organizer. The two woven handles can carry the lightweight shower candy easily. The compact, small and creative design of the item made it easily fits in any sized bathrooms. The caddy comes with a bigger center compartment and six small pockets. The bigger compartment is to accommodate big items and smaller ones are for small-sized products. The sturdy built construction made this product usable for long times. It will not rip for years. You can perfectly use it for camping, gym, travels, etc. These best shower caddies usually have nice designs and better-storing options. However, these caddies fit different bathrooms. You will need to take a look at your shower space and then choose which model you want for your bathing space. Of course, all these brands have their own additional benefits to go with compartments. If you are willing to do further research about best shower caddy, then this article will serve as the starting ground for you.